“Freight availability is starting to improve, after a long, quiet winter. You can finally be a little bit choosier about which loads to accept, but rates are slow to ramp up. How can you make more money? “Tip #1. GO TO WHERE THE LOADS ARE GOING TO BE. 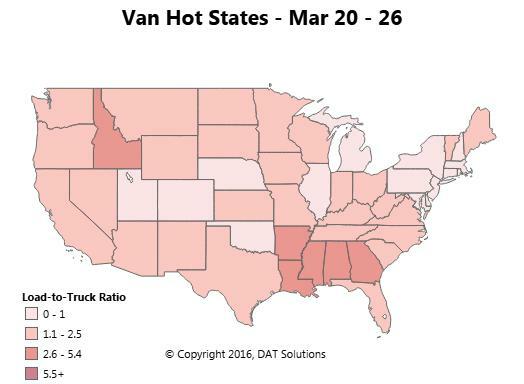 This Hot States Map shows that outbound load volume was high in the Southeast last week, and truck capacity was low. Those darker-colored states represent areas of opportunity for van fleets. Daily maps in DAT Power and DAT RateView show the load-to-truck ratio for 149 individual freight markets in the U.S.
“Tip #2. REMEMBER: EVERY BACKHAUL HAS A HEAD HAUL. “There is always more freight and higher rates in one direction than the other. The backhaul might be really low, or the lane might be pretty well balanced. If you have choices, take a load into a place that has good loads to get you back home. “Sometimes, taking a low rate for a relatively short distance can be a good choice. You’re better off taking the worst “buck-a-mile” backhaul, instead of a zero-dollar deadhead, if you can use it to re-position your truck for better opportunities. “Tip #3. KNOW YOUR MARKETS. “This tip has two parts. Your origin market comes in one of two flavors: head haul markets have higher outbound rates, and backhaul markets have low rates. Some markets are a little bit of both, depending on your outbound direction. HEAD HAUL MARKET.If you’re starting in Memphis, or another place with above-average rates, a little extra planning can turn a so-so roundtrip into a really good one. A load out ofMemphis might go to Chicago or to Columbus. The load toColumbus pays 12¢ more per mile, for about 50 more loaded miles. The roundtrip average forMemphis-Chicago-Memphis is $1.60/mile.Columbus pays $1.51. ButMemphis-Columbus-Memphis gives you 100 more loaded miles. You’ll make $70 more, total. “What’s the best roundtrip? They’re both pretty good, but Chicago is better, even though you get paid a little less for the roundtrip. Why? You save about $35 in fuel, plus other direct costs, because it’s a shorter trip. If you are based inColumbus, you might still go to Memphis, because you know the return trip is good. Or you could take a load toChicago first, and then take a second load from Chicago to Memphis. That’s a TriHaul. Or you can “kick it up a notch,” as one celebrity chef used to say. Go home the same way:one load from Memphis to Chicago, and a second load from Chicago to Columbus. “Instead of leaving Columbus for a 1,200-mile roundtrip with two loads — one backhaul and one headhaul — now you have an 1,800-mile trip with four loads. That adds about 50% more loaded miles. AND the rate per mile is higher – you average $1.88/mile instead of $1.51. “You’ll also add a day or a day and a half to your trip, but if the schedule works, it’ll be worth it. After that detour to Chicago, you’ll come away with almost $3,300 instead of $1,800. That could be a good week. This “TriHaul Plus” route pays over $1,500 more than a straight roundtrip. Creative route planning can help boost your revenue and profit. Shorepower Technologies partners with DAT to offer a special on the TruckersEdge load board to its members. Sign up for TruckersEdge today and get your first 30 days free by signing up at www.truckersedge.net/promo731 or entering “promo731” during sign up. Note: This article was adapted from DAT’s blog post. It was first published in March, 2016.